Cape Town is situated in the south-west point of the country of South Africa and is the country’s second-most populous city after Johannesburg. The city is South Africa’s legislative capital and is famous for its harbour and its outstanding natural beauty. Some of the city’s well-known landmarks include Table Mountain and Cape Point, making the city South Africa’s number one tourist destination. The city is served by Cape Town Airport with many passengers choosing to arrange their car hire to be collected once they land at the airport. Cape Town is situated on the shore of Table Bay and the city was originally developed by the Dutch East India Company as a station and stopping point for Dutch ships travelling to East Africa, India and the Far East. The city very quickly outgrew its original purpose as the first European outpost at the Castle of Good Hope and it became the economic and cultural hub of the Cape Colony. Cape Town enjoyed the title of being the largest city in South Africa, until the Witwatersrand Gold Rush and the development of Johannesburg. The city is largely cosmopolitan and is one of the most multicultural cities in the world, which reflects its role as a major destination for immigrants and expatriates to South Africa and as of 2007 the city had an estimated population of 3.5 million residents. The city enjoys an ocean Mediterranean climate with mild and moderately wet winters, while the summer months are dry and warm. The winter months which span from the beginning of June to the end of August see large cold fronts that enter the city for a limited time before making their way up the country from the Atlantic Ocean with strong westerly winds. While during the summer months the region can get uncomfortably hot when the ‘Berg Wind’ or ‘Mountain Wind’ blows from the Karoo interior for a few weeks during February or early March. The average daily highs in summer can reach around 26°C and in winter the highs rise to around 17°C for the duration of the winter months. Cape Town is a very popular tourist destination, not only among international visitors but also visitors from the rest of the country as well as the rest of Africa. This is due to the city’s good climate and breath-taking natural beauty, the most popular landmark of which is Table Mountain, which forms a large part of the Table Mountain National Park. The summit of this impressive mountain can be reached by either hiking or by the Table Mountain Cableway. Car rental is an excellent way to see all the sights at your own leisure. 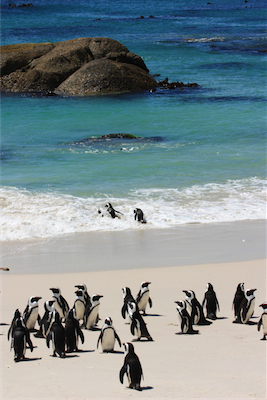 Many tourists are also drawn to Cape Town’s numerous beaches, which are also popular with the residents. It is also possible for tourists to visit several different beaches on the same day, each with its own atmosphere, due to the city’s unique geographical make-up. The best way to discover Cape Town is by renting a car. Renting a car is easy and affordable way of transportation. With your rent a car you can explore the beautiful surroundings of Cape Town. Rentalcargroup.com works with numerous rent a car companies in Cape Town. Parking your rental car in Cape Town can best be done in a garage. Its safer for you and your rental car. There might be the possibility to park your rental car in the outskirts of Cape Town and move around by public transportation which is not too expensive and will compensate for the parking fee you will need to pay if parking in the city center. Take in mind that many big cities have a city center only accessible for locals or delivery purposes. Last month, the average car rental length in Cape Town was 13 days. The average rental car length in Cape Town is 4 days. The most booked rental car type currently in Cape Town is COMPACT cars. Last year, the most booked rental car type in Cape Town were ECONOMY cars. How much does it cost to rent a car in Cape Town? Last month, the average car rental price was 361 USD. Last year, how much did it cost to rent a car in Cape Town? Last year, the average car rental price was 105 USD. What is the current average daily price to rent a in Cape Town? Last month, the average rental price was 27 USD per day. How much did it cost to rent a car in Cape Town over the past 12 months? Last Year, the average rental price was 26 USD per day. The car rental companies available in Cape Town are: . See below last 5 customer reviews. Our customers rated Cape Town Car Rental with an average of 0.00 based on 0 ratings.